Available in 3,000 to 4,000 lb. lifting capacities, the new line is exceptionally rugged and durable providing technological and ergonomic enhancements that improve performance and increase operator comfort. The new 8-Series Electric Stand-Up Rider features Toyota's innovative AC technology resulting in better travel speeds, consistency in performance throughout the battery charge and reduced maintenance costs. 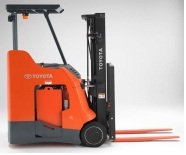 The forklifts are ideal for use in general warehouse and storage operations, automotive and general manufacturing, and all operations needing a dock-to-stock solution for multi-tasking functions and constant on and off for loading and unloading. "With the latest in AC technology and advanced ergonomics, the new 8-Series Electric Stand-Up Rider provides superior value with outstanding performance, productivity and operator comfort," said Cesar Jimenez, national product planning and training manager. The new 8-Series Electric Stand-Up Rider operates using Toyota's industry-leading AC drive and lift system, which is designed to conserve or regenerate power, maximizing performance efficiency between battery charges. The AC-powered system delivers quicker acceleration and higher top speeds compared to the company's previous Stand-Up Rider models, while also offering precise pallet retrieval and positioning control. In addition, the AC motor contains no brushes, springs, commutator or wearable parts to inspect or replace, reducing maintenance costs and forklift downtime. A number of features on the 8-Series Stand-Up Rider are designed to exceed the demands of tough workplace environments and improve overall productivity. Dual steer tires improve weight distribution to reduce tire loading pressure by approximately 30% and help provide longer tire life. Moisture-resistant electrical connections work to protect the Stand-Up Rider against water intrusion and corrosion. Large diameter drive tires enable the forklift to withstand continuous impact between dock plates. A cornering speed control system works to automatically slow the forklift's travel speed while turning helping prevent damage to loads. In addition, the 8-Series Stand-Up Rider's mast tilt centering option conveniently levels the forks parallel to the ground from both the back tilt and front tilt positions. An optional 16.5-inch battery compartment is offered on the 3,000 and 3,500 lb. models to increase maneuverability in tight, confined work areas. Along with speed, performance and productivity enhancements, the new 8-Series Stand-Up Rider offers improved ergonomic features to support operator comfort on the job. The new model includes a shock dampening, isolated compartment floor and thicker floor mat with a universal low-effort brake pedal to reduce strain on the operator's ankles, knees, hips and lower back. The new Stand-Up Rider also features a redesigned contoured, cushioned padded backrest and armrest with a new larger elbow pad for operator comfort. For tall operators an optional extended backrest adds 10" of additional support. Engineers also integrated a new single-axis, intuitively mapped multifunctional control handle to allow one-handed operation of all hydraulic functions. Detailed features such as an integrated clipboard, amenity tray and cup holder also provide a convenient, easy-to-reach mobile workstation. To locate a local dealer or for additional information on the Stand-Up Rider for sale, please visit www.toyotaforklift.com.